Monster Hunter World PC is finally out in the wild, plus we've go all the info on the Monster Hunter World DLC, reviews and more. We've also got all the Monster Hunter World weapons and monsters. The Monster Hunter World PC port finally released back in August, but you'll need a pretty pricey rig if you want to run it at the 60FPS benchmark. In this Monster Hunter World PC guide, we'll be walking you through everything you need to know about the base game, as well as the PC port of Capcom's incredibly successful game. There's a full section of Monster Hunter World PC reviews roundup, as well as the complete range of recommended Monster Hunter World PC specs. For more info and help with the game, head to our Monster Hunter World Guide hub. It's full of useful info about every aspect of Capcom's deep action RPG. Back near the beginning of 2018, Monster Hunter World launched on the PS4 and Xbox One, releasing in late January. Later on in the year, Capcom revealed that the PC port of Monster Hunter World would be releasing on August 9, through Steam. OS: WINDOWS® 7, 8, 8.1, 10 (64-bit required). Processor: Intel® Core™ i5-4460, 3.20GHz or AMD FX™-6300. Graphics: NVIDIA® GeForce® GTX 760 or AMD Radeon™ R7 260x (VRAM 2GB). Sound Card: DirectSound (DirectX® 9.0c). Additional Notes: 1080p/30fps when graphics settings are set to "Low". USgamer: 5/5 - "The next generation of Monster Hunter has finally begun, and, with Monster Hunter World, it's off to an incredibly good start." Eurogamer: Essential - "Monster Hunter World sees 13 years of evolution come crashing together with some new influences to create a very exciting breed of beast." IGN: 9.5/10 - "Bold and newly beautiful, Monster Hunter: World demands to be played on its own terms and rewards you with an amazing RPG." Gamespot: 8/10 - "The Monster Hunter formula has definitely honed its claws, and all the above factors play their part in making Monster Hunter World a meaningful evolution for the series at large." In the months following the launch of Monster Hunter World near the beginning of this year, Capcom outlined post-launch content plans for the game. 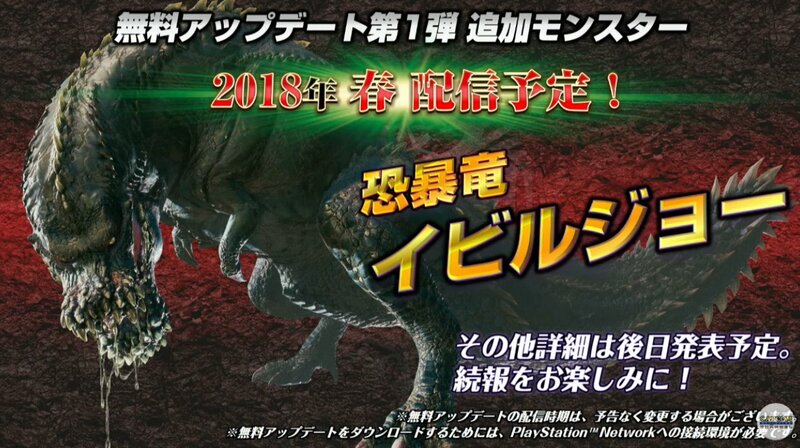 The first creature to be added to the game after launch was the Deviljho, and if you want a complete recap of all past beasts that have been added to the game since, you'll want to head over to our Monster Hunter World events guide. If you want a recap if all the 14 types of weapons available for players to use in Monster Hunter World, check out all the videos from Capcom just below. Tagged with Adventure,	Capcom,	Guides.